Shirts With Random Triangles: Gene Stallings discusses A.J. McCarron and Johnny Manziel. Gene Stallings discusses A.J. McCarron and Johnny Manziel. 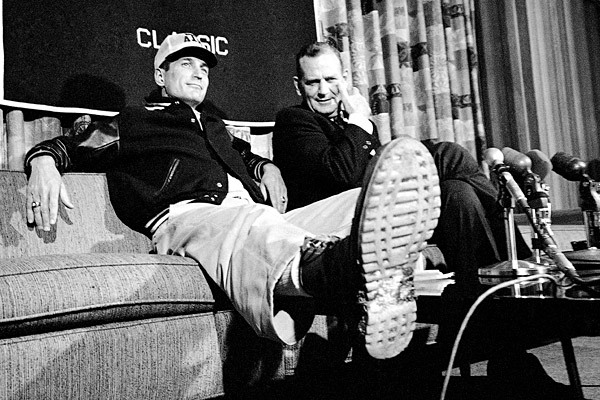 Gene Stallings (left) and Bear Bryant (right) in 1967. Via ESPN. College football legend Gene Stallings was a defensive back and later head football coach at Texas A&M. He later became HC of Alabama, where he led the Crimson Tide to the 1992 national title. Given his connection to both schools, meeting this weekend in College Station (you might have heard something about it), he was asked by Mobile, Al. radio station WNSP-FM to "compare and contrast" the respective starting quarterbacks ofAlabama and Texas A&M, A.J. McCarron and Johnny Manziel. Of course, with connections to both schools, Stallings took the diplomatic route in handling the question. "Really, you can't," Stallings said of the comparisons. "You take the Alabama quarterback. He threw 30 touchdown passes and three interceptions last season. He's more of a team player. He doesn't feel like he has to win it by himself. "Yet, when you look at Texas A&M, Manziel makes plays running the ball and passing the ball. He's sort of the real spark of their football team. Both of them perform extremely well. "A good question would be if you could just have one of them, which one would you take? That's not a question I'm going to answer. They're both extremely talented." You can listen to the full 10:33 interview here, which also includes Stallings discussing the legendary Bear Bryant.